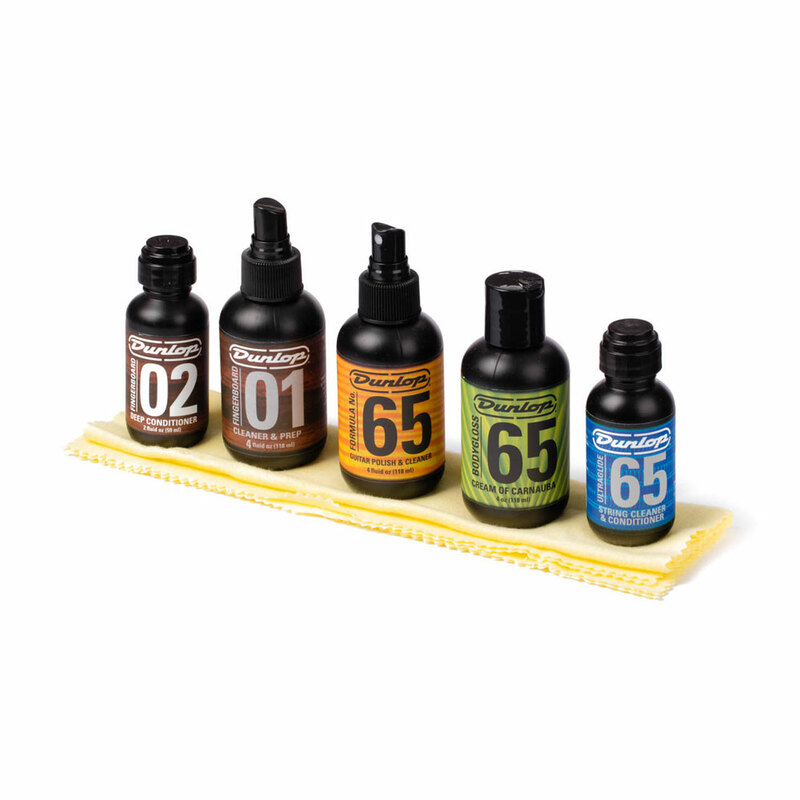 The Jim Dunlop Formula 65 Care Kit contains everything you need to properly care for your guitar's body, fingerboard and strings. The kit is made up of a 4oz Polish and Cleaner, 4oz Bodygloss Cream of Carnauba wax, 2oz Ultraglide 65 String Conditioner, 4oz Fingerboard Cleaner and Prep, 2oz Deep Conditioner Oil, 2 Microfibre cloths, 1 micro fine fret polishing cloth and a step by step guide. Bodygloss Cream of Carnauba wax is made of the highest grade carnauba wax available. This special formulation polishes, protects and beautifies. It hides and seals surface cracks while it provides a smudge free, moisture and stain resistant barrier. Polish and cleaner removes dirt and grease build up from your guitar's surface while polishing and protecting its clear coat finish to keep it looking good as new. Ultraglide 65 String Conditioner is the number 1 way to restore brilliance to your strings and increase their life. The formula conditions your strings with a silky smooth playing surface while shielding against tarnish and corrosion.